Why Did It Have To Be Names? All writing is hard work and anyone who tells you differently has never tried to make a living out of putting words on a page. It’s incredibly rewarding hard work, but hard work nonetheless. Of all the million fragile things that need to align to coax that unformed work of art in my head onto the page, the one that almost always gives me the most headaches is finding names for things. A bad name can hamstring a character from the outset and really weigh down their development on the page. I’ve had stories that I’ve struggled to get going, that have later soared when I realised that the names I’d chosen for my main characters weren’t working. And when it’s right, it’s like a great piece of music that feels like there’s only one way those notes could possibly have fitted together. Working predominantly in the tie-in field means some of the naming work has been done for me, but often that’s not quite the leg-up you might think. The names that exist in the worlds of 40k and Heresy have been kicking around the block in one form or another for up to thirty years. To the readers of such fiction, those names have had time to bed in and make themselves comfortable. The names I have to invent need to set those names as their bar for longevity if they’re going to feel right sharing a page with people like Roboute Guilliman, Leman Russ and Abaddon (okay, that one’s been around even longer…). A name has a heavy burden to bear. A good name can make a character/race/magic sword/starship, just as a bad one can ruin it. A good name tells me something about the character, either by its style or sound or meaning. A good name just works, because there’s a strange alchemy that goes on in everyone’s head when they hear a name for the first time. I might have had the idea and name for a particular character for a long time, but seeing their name on the page is the reader’s first contact with them. And for good or ill, they’ll start to form an opinion about them from the outset. When you or I hear a name, our brains make all sorts of assumptions, interpolations and snap judgements based on its perceived history, sound and feel in the ear. I’d bet the farm all of us would respond differently to a Tarquin Fotheringay III than we would to a Dave Smith. It’s no different in fantastical fiction, though there’s no real shorthand to the names that exist in our fictional worlds unless it’s created by the writer. That’s fine, that comes in the telling, but there’s no immediate way to buy that innate reaction to a name. So you have to borrow it. Using names that are variations on names you’d find in this world is a good way of piggybacking on that ‘first impression’ reaction. Sure, you might have to dig pretty deep to find those names in this world, but if they come from a culture that’s likely to be at least vaguely familiar to the reader, there’s a good chance you’ll get away with it. Using names with a basis in reality is a good way of bypassing the effect whereby names made up by middle-class white guys often sound just like names made up by middle-class white guys. You know a name’s right when you hear it, and when you have it, you know there’s no other name that could possibly fit. Oh, and just to make thing even more awkward, how you process a name is important too. In other words, what a name looks like on the page is just as important as how it sounds, because, unless they’re listening to an audiobook, the reader isn’t likely to be reading it aloud. The project I’m working on just now is a Horus Heresy novel called Vengeful Spirit, and there’s one particular squad of characters I had to find names for. They’re Space Marines drawn from a variety of backgrounds, and their names needed to reflect the character of their legions without being too broadly drawn. The reader needed to be able to instantly differentiate between the characters, without saddling each one with a long winded name that necessitated constant flicking back to the dramatis personae page. Their names needed to be individual enough, memorable enough and distinct enough to be recognisable, cool-sounding and weighty enough to feel right. And let me tell you, that was a long two days of scouring the web, historical sources, myths and legends, alternative languages and just looking at the page to see how they related to one another. Graham McNeill on Twitter, Facebook, and Web. The next guest on the blog is author Adrian Tchaikovsky, and his post will go up a week from now, next Monday on the 8th. There won’t be a post this Thursday. You can check out the full schedule in the link up top. Posted on July 1, 2013, in Debut Authors Guest Series, Guest Posts and tagged Angel Exterminatus, Black Library, Debut Authors Guest, Ghouls of the Miskatonic, Graham McNeill, Guest Posts, Horus Heresy, Iron Warriors, Names, Names A New Perspective, Priests of Mars, Storm of Iron, The meaning of Names, Ultramarines, Uriel Ventris, Warhammer, Warhammer 40000, Warhammer Fantasy. Bookmark the permalink. 4 Comments. 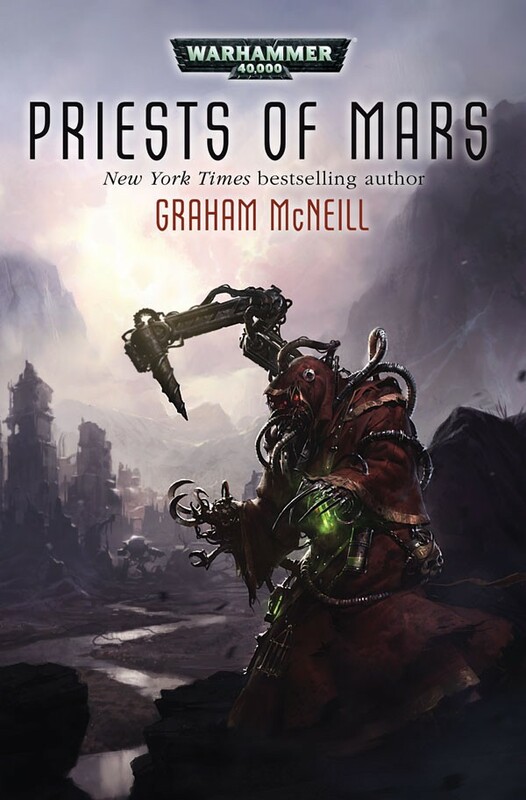 I should really be writing for Nano… but McNeill himself? Sweet! Terrific article, and good to know I’m not the only one gets ties in a bundle over choosing names for characters.